When you’ve had your fill of turkey sandwiches and turkey soup, but there are still leftovers waiting to be eaten in the fridge, choose greatness. 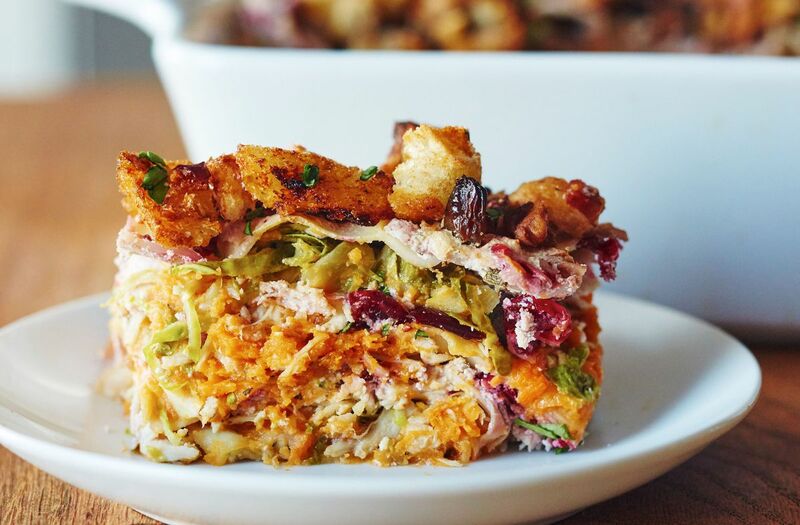 And by greatness we mean a towering lasagna filled with layers of roasted Brussels sprouts, creamy sweet potatoes, Thanksgiving stuffing and of course, turkey. One might even argue that this next-day meal is even better than the main event itself. Come Friday, we're trying to figure out a way to relive the glory of that meal all over again — just without the effort. With that in mind, we present this Thanksgiving leftover lasagna. Consider it an invitation to let your leftovers get a little handsy all in one dish. Arrange a rack in the middle of the oven, and heat to 375 F. Coat a 9-by-13-inch baking dish (glass or ceramic) with cooking spray; set aside. Place the ricotta, cranberry sauce, egg herbs and salt in a large bowl, and whisk until smooth. Spread 1/2 cup of the gravy in a thin layer on the bottom of the baking dish. Top evenly with 1/3 of the noodles, 1/2 of the potatoes, 1/2 of the Brussels sprouts, 1/2 of the turkey, and 1/3 of the ricotta mixture. Repeat layering with 1/3 of the noodles, 1/2 cup of the gravy, the remaining potatoes, remaining Brussels sprouts, remaining turkey and 1/3 of the ricotta mixture. Finish with the remaining noodles. Top the final layer of noodles with the remaining gravy. Spread the remaining ricotta in a thin, even layer over the gravy. Top with the dressing or stuffing in an even layer. Bake until the noodles are tender, the top is golden-brown, and the gravy is bubbling, about 40 minutes.